The Deluxe Electric Mistress is the flanger that we see in here the most. It’s a great sounding flanger but there are so many reasons that it’s not friendly for a gigging musician. We’re offering a standard rehousing service which addresses common problems and keeps the cost lower than doing a custom rehousing each time. First we’ll take the guts and put them into the 4.5″ x 5.5″ casing that you see above. The jacks are changed to a more conventional layout. We rewire the pedal for true bypass and add a status LED as well. If your pedal is an older model which has a 3-prong cord then we’ll convert it to accept a 24V 2.5mm DC power supply as used in the current models. We found that the best way to rehouse this pedal involves wiring the Color knob in reverse (clockwise is minimum; counterclockwise is max). This is done intentionally and is a result of moving the pots which also support the weight of the PCB. 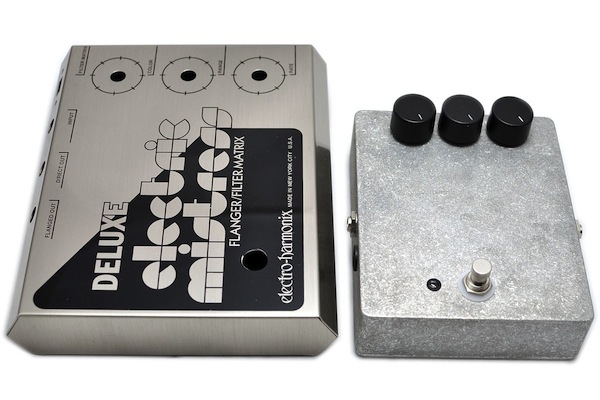 The end result of the changes is a pedal that sounds 100% as it did from the factory but in a smaller, pedalboard-friendly package. Other add-ons include installing a volume boost circuit to bring the volume up to unity gain or a simple Enhance mod which brings out the highs and lows in order to compensate for the volume drop. Check out www.fxdoctor.com for current pricing and a video to demonstrate the Enhance mod.